The entire world is decked out in pink for Breast Cancer Awareness month. Everywhere I go it’s pink, I’m in Panera right now, (well all day studying) and they have pink balloons, ribbons & proceeds of one of their bagels is going to support breast cancer research which is great and all, but I found out October is also Vegetarian awareness month. I think this is SOOOOOOO important- your diet has associations with cancer, but more because you don’t need to have meat at every meal and these meatless meals can be delicious and nutritious. Plus you could possibly be healthy. I’m not a vegetarian, but think I’m pretty close to it. I usually eat meat at one meal either breakfast or dinner, (these days since I’ve been in school I really don’t have a lunch) and It’s never the majority of my meal- most times a quarter of my food. I love veggies, and my meal IS incomplete if I don’t see green on my plate. Often you’ll hear that vegetarians don’t get the recommended amount of protein, but that isn’t necessarily true. Also, there are many other ways to get protein, You can get protein and the essential amino acids from veggies. (Chef Ahki is of course one of my sources, and I tend to agree with her.) Also, there are so many legumes, nuts, seeds and grains that provide protein and will lead you feeling satisfied. If you’re the type of person who likes to explore and create new dishes this is a great way to do just that. I don’t participate in Meatless Monday, I participate in imma go meatless whenever I want to at least 2-4 times a week. I just made that up..could you tell? HOWEVER, I do think Meatless Monday is a great way to get started; you have the weekend to prep and participate in this first thing in the week. I only eat chicken/turkey/fish/seafood so I don’t eat red meat- the type of meat that ways ya down and just sits in your colon for hella long. There are pros to eating red meat, but I think the cons definitely outweigh the positive aspects. Confession: Once a year I have oxtails. i love mi oxtails, gotta ave dem. At home I loved making pizza for my family, however, since it’s just me I didn’t know what to do because I didn’t want the large crust. Weeeell I figured it out, I used (whole wheat) tortilla wraps. 2 as the “crust” I tried olive oil in the middle, but cheese works way better to hold your toppings and not get soggy. From there I sauteed my veggies and made the pizza like normal. I ate 2 for dinner one day but yesterday I made it again and only had one with a side of stir-fry and corn. Today for dinner I have a half of a Mediterranean veggie sandwich from panera. I have no idea how it will taste, we adventurous over chea! Mushrooms/Onions/Kale.. I couldn’t find my broc. ALSO yesterday I was watching barefoot contessa, and she made this eggplant caponata and it looked amazing plus the reviews for the recipes are just fantabolous. I’m looking for fairly easy meals to start incorporating in my life. If you have any please please please share! And for anyone out there who always eats meat, try a meatless meal first, then try two meatless meals, then try the whole day. I promise you It’s not overly challenging, and it’s great for you. 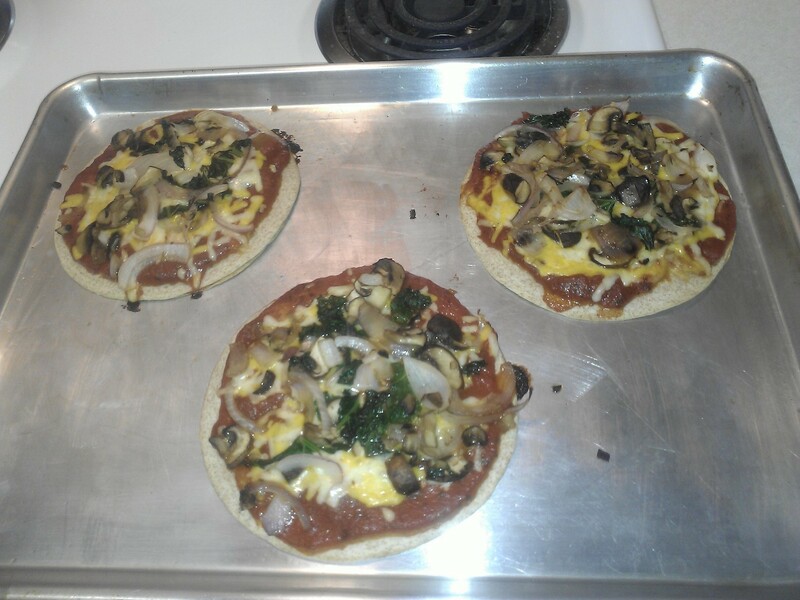 This entry was posted in Nutrition, Overall Wellness, Recipe and tagged october, pizza, vegetarian month on 10/17/2013 by The Tenth Muse.